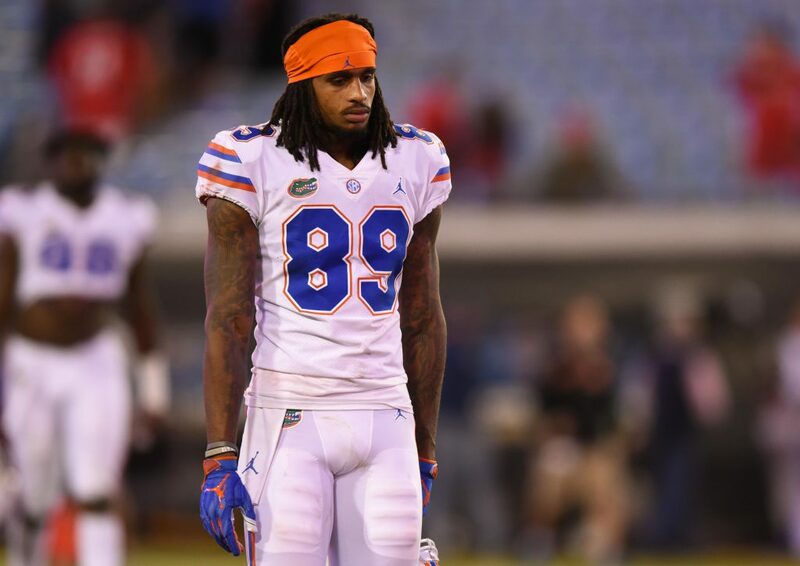 After the final seconds tick down on the clock, Florida wide receiver Tyrie Cleveland (89) stands on the field after his team falls to No. 7 Georgia. 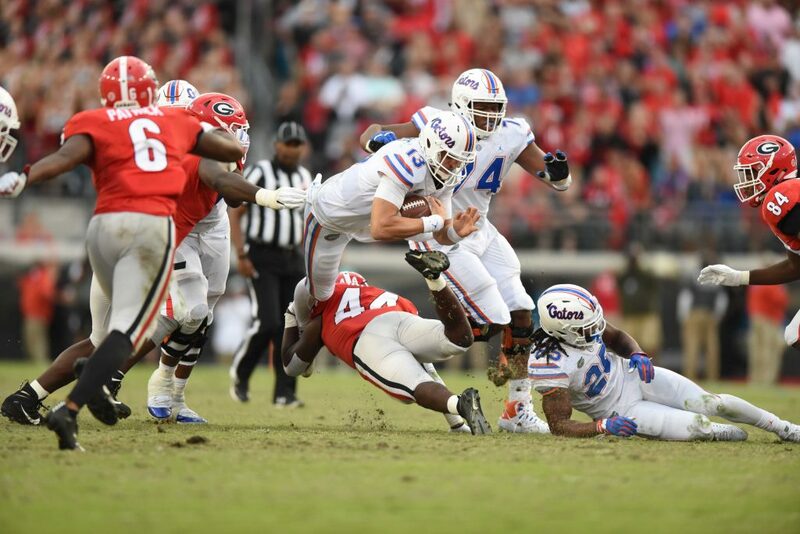 Georgia linebacker Juwan Taylor (44) takes out the legs of Florida quarterback Feleipe Franks (13) as he dives for the first down. 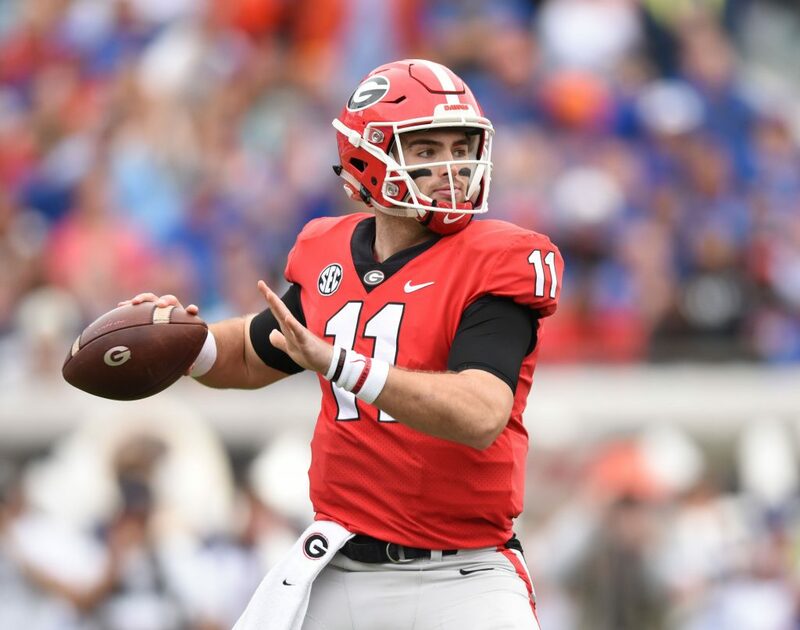 Georgia quarterback Jake Fromm (11) drops back to pass. Fromm lead all passers with 240 yards, threw for 3 touchdowns, and completed 17-24 pass attempts. 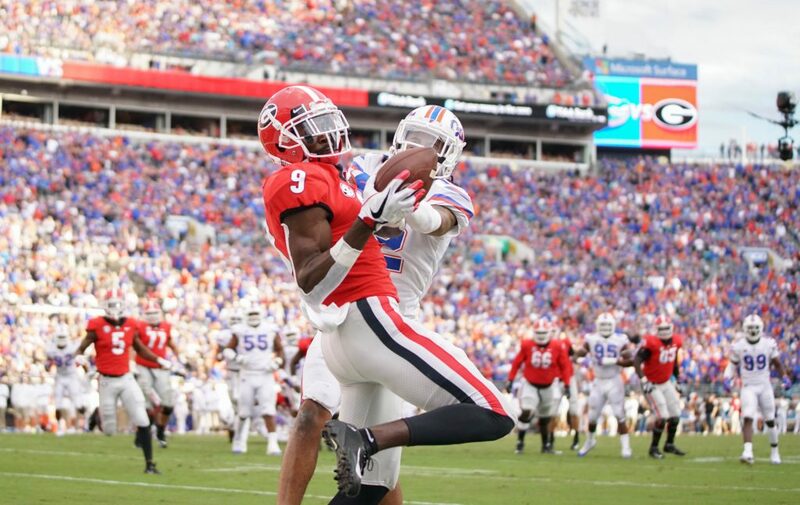 Florida wide receiver Tyrie Cleveland (89) catches a pass from quarterback Feleipe Franks (13) and turns up field while being pursued by Georgia defenders D’Andre Walker (12) and Richard LeCounte (2). 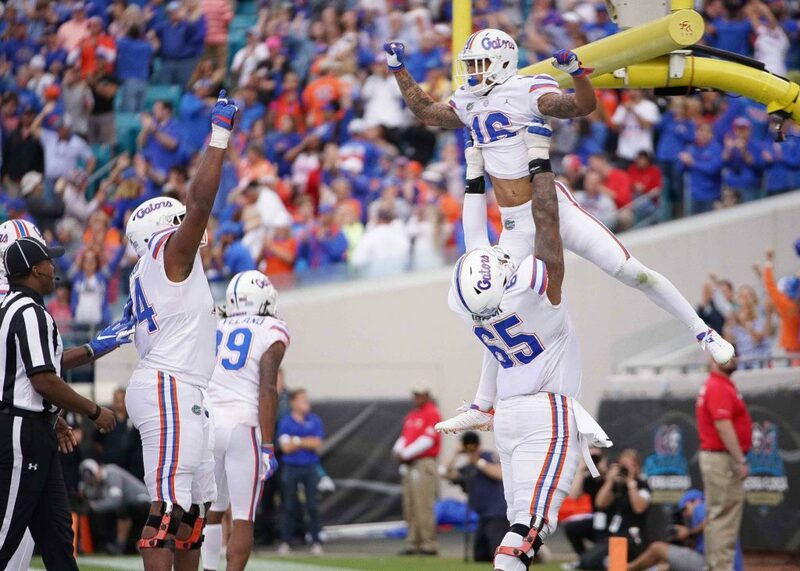 Florida wide receiver Freddie Swain (16) is lifted in the air by offensive lineman Jawaan Taylor (65) after catching a 36-yard touchdown pass from quarterback Feleipe Franks (13) in the second half. 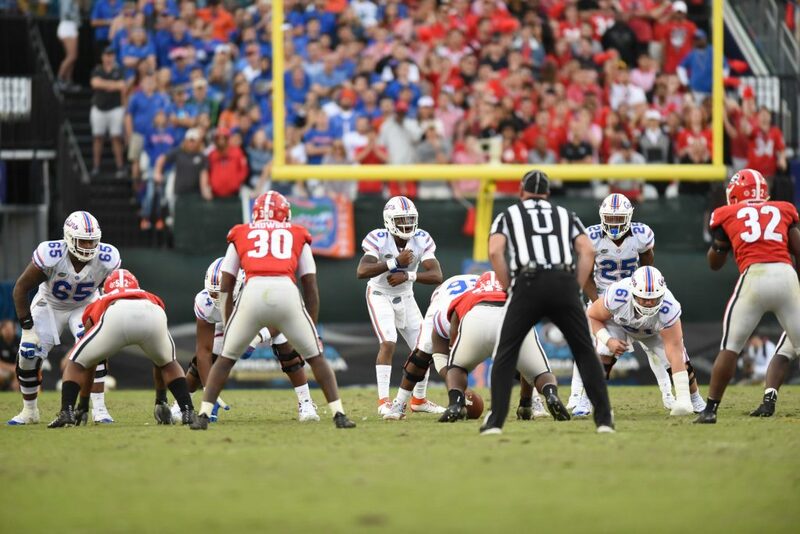 Georgia linebacker Monty Rice (32) forces a fumble as he strips the ball from Florida running back Jordan Scarlett (25). 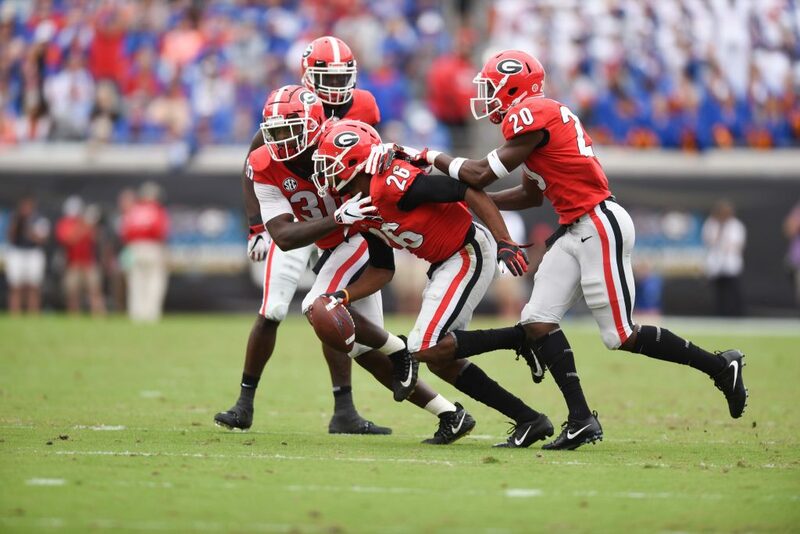 Georgia defensive back Tyrique McGhee (26) celebrates with teammates after intercepting a pass throw by Florida quarterback Feleipe Franks (13). 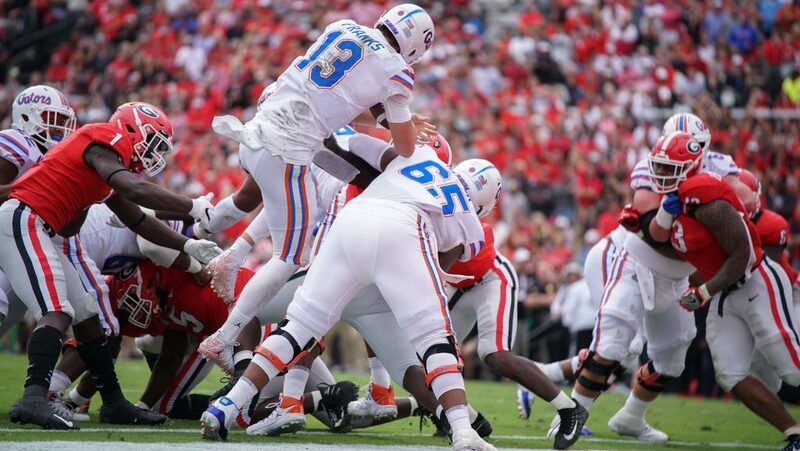 Florida quarterback Feleipe Franks (13) goes over the top of his offensive line on the goal line to score a touchdown in the first half. 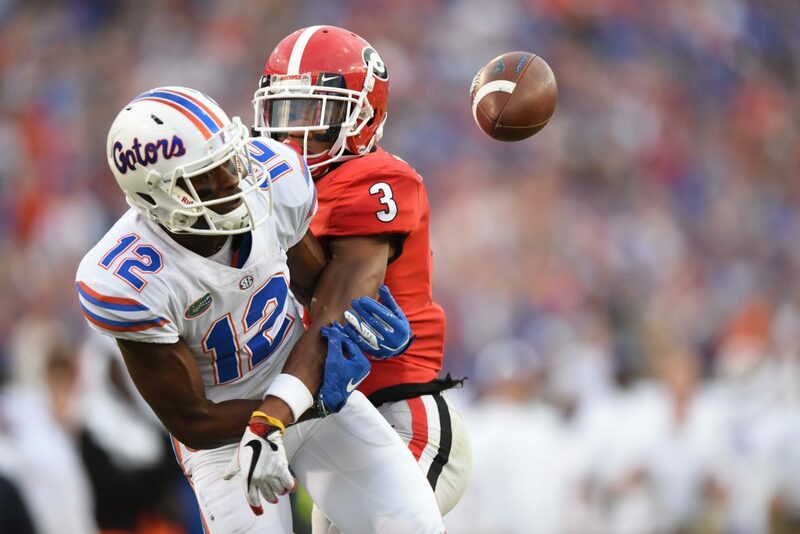 Georgia defensive back Tyson Campbell (3) is called for pass interference while covering Florida receiver Van Jefferson (12). 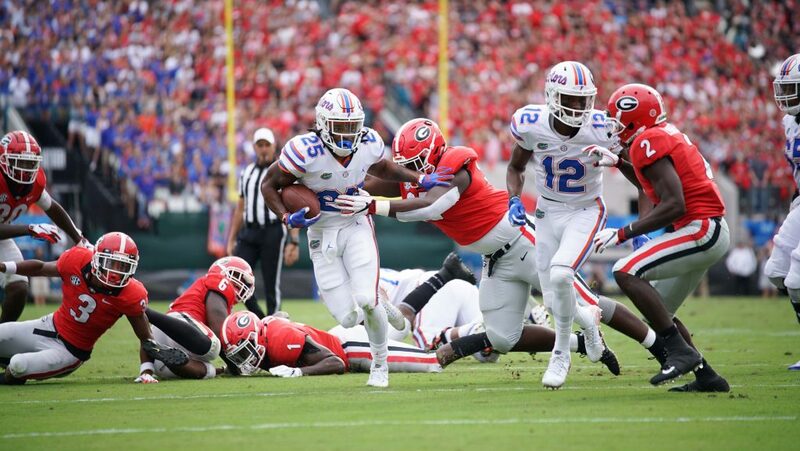 Georgia running back D’Andre Swift (7) stiff arms Florida defensive back Jeawon Taylor (29). Swift lead all rushers with 104-yards on 12 carries, and scored 1 touchdown for the Bulldogs. 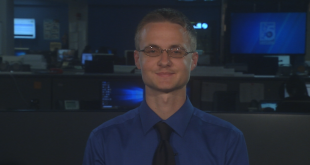 Despite tight coverage from Florida defensive back C.J. McWilliams (12) Georgia’s Jeremiah Holloman (9) pulls in a 12-yard touchdown pass from quarterback Jake Fromm (11). 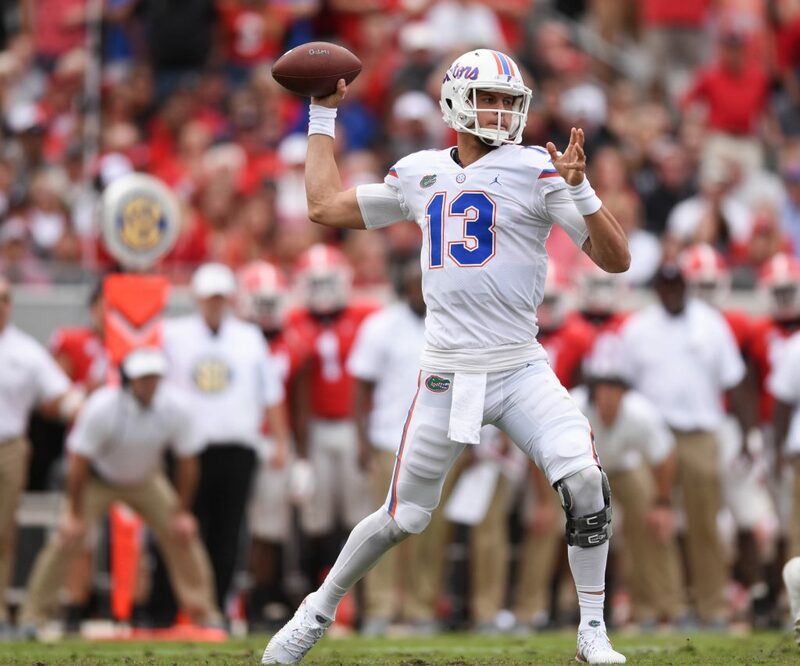 Florida quarterback Feleipe Franks (13) drops back to pass. 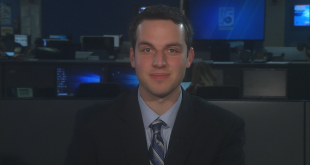 Franks completed 13 of his 21 passes for 105-yards and one touchdown, threw one interception, and ran for a touchdown. 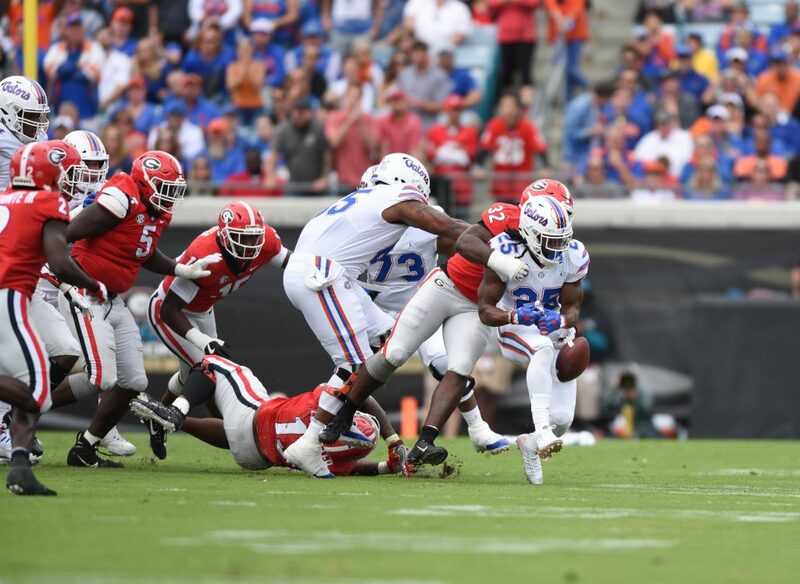 Florida running back Jordan Scarlett (25) breaks through the Georgia defensive to pick up some yardage on the ground. Scarlett finished the game with 56-yards on 8 carries. 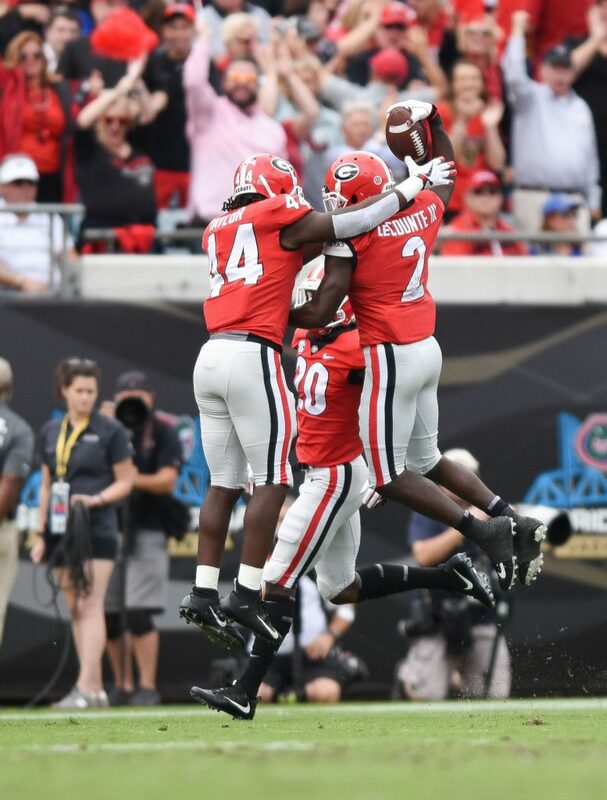 Georgia defensive back Richard LeCounte III (2) celebrates with his teammate Juwan Taylor (44) after recovering Florida running back Jordan Scarlett’s (25) fumble in the first half. 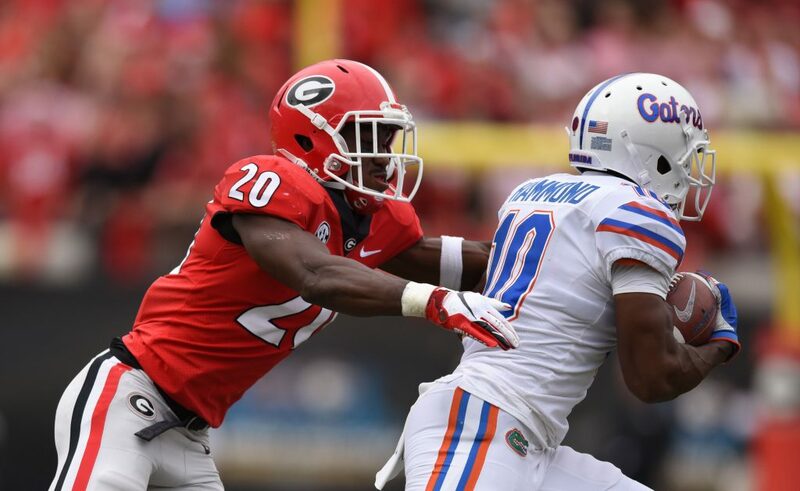 Florida wide receiver Josh Hammond (10) tries to break free from Georgia’s J.R. Reed (20) after catching a pass. 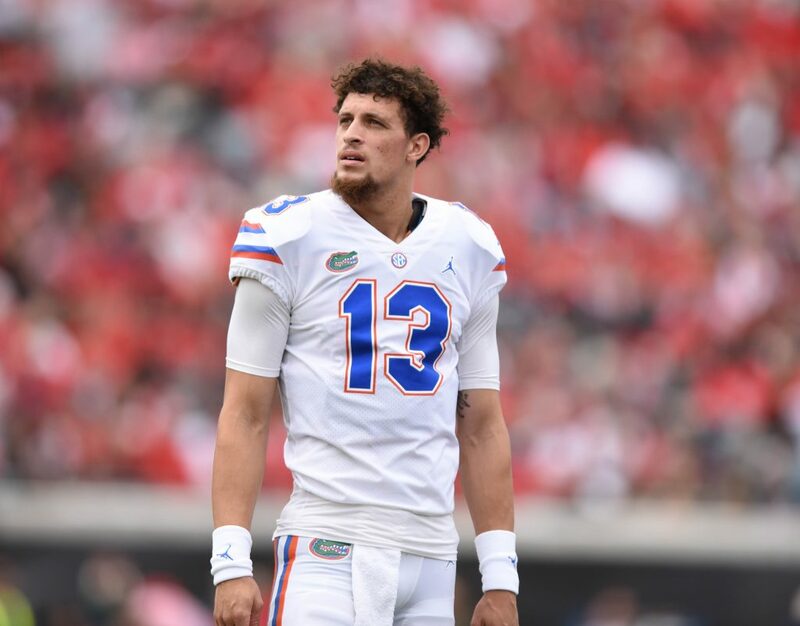 Florida quarterback Feleipe Franks (13) looks to the jumbotron after throwing an interception in the first half. 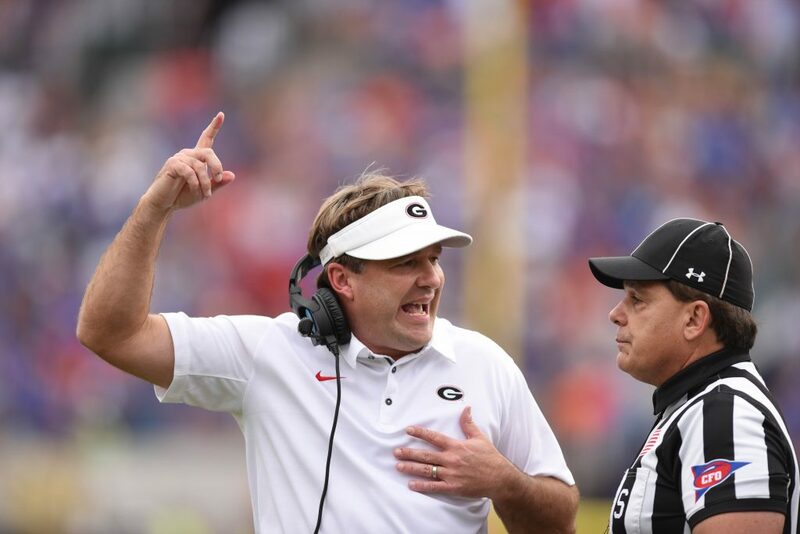 Georgia coach Kirby Smart speaks to the official about the football touching the camera wire during a Florida punt. It was confirmed the ball touched the wire and Florida was forced to redo the punt. 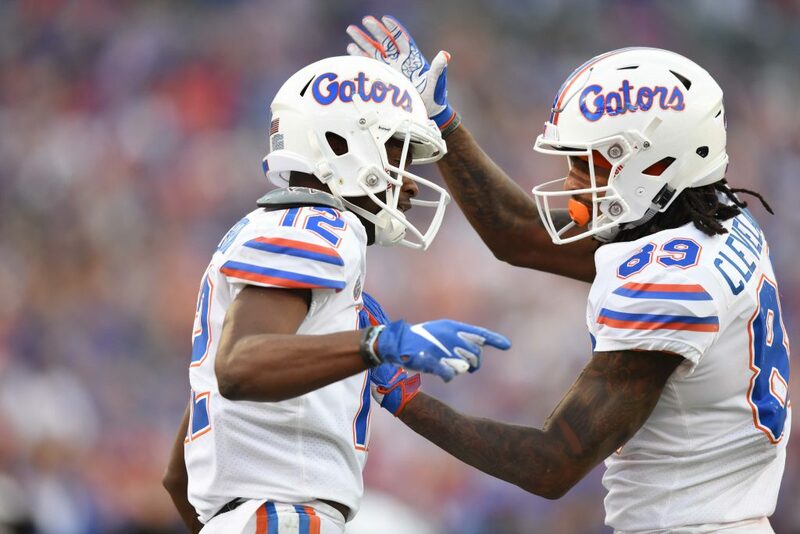 After missing a catch due to Georgia pass interference, Florida wide receiver Van Jefferson (12) is encouraged by his teammate Tyrie Cleveland (89). 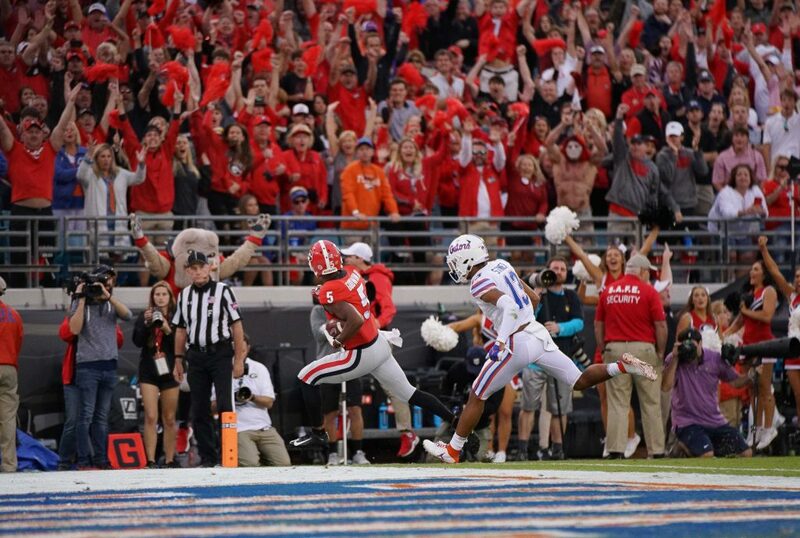 Georgia wide receiver Terry Godwin (5) looks toward the crowd as he glides into the endzone for a touchdown after catching a 24-yard pass. 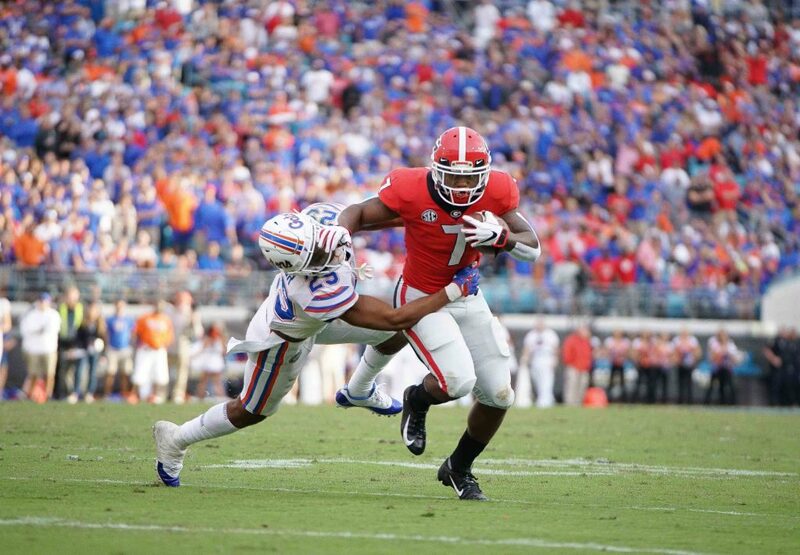 Georgia running back D’Andre Swift (7) finds himself all alone as he runs to pick up yardage before being brought down by the Florida defense. 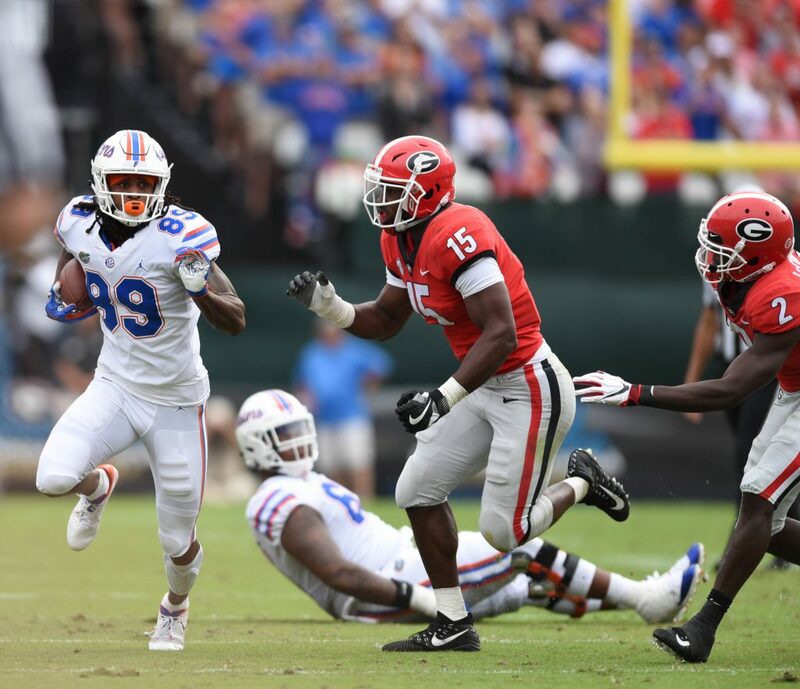 Florida running back Kadarius Toney (4) pushes off Georgia defensive back J.R. Reed (20) after catching a pass. 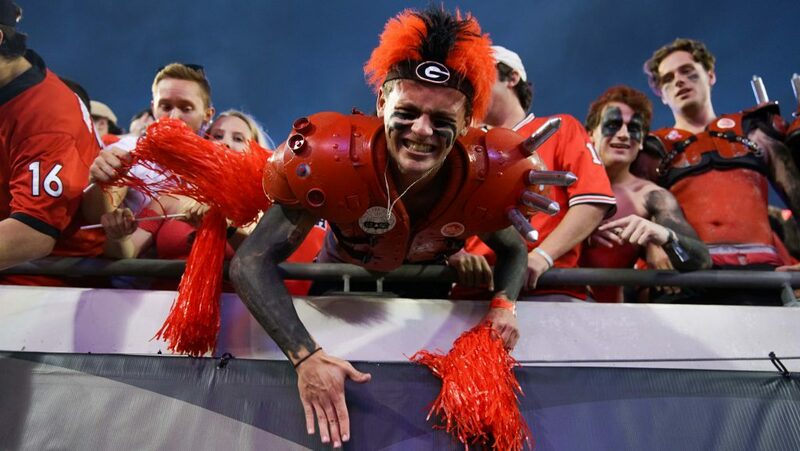 A passionate Georgia fan shows enthusiasm as it becomes clear his team will secure the victory. 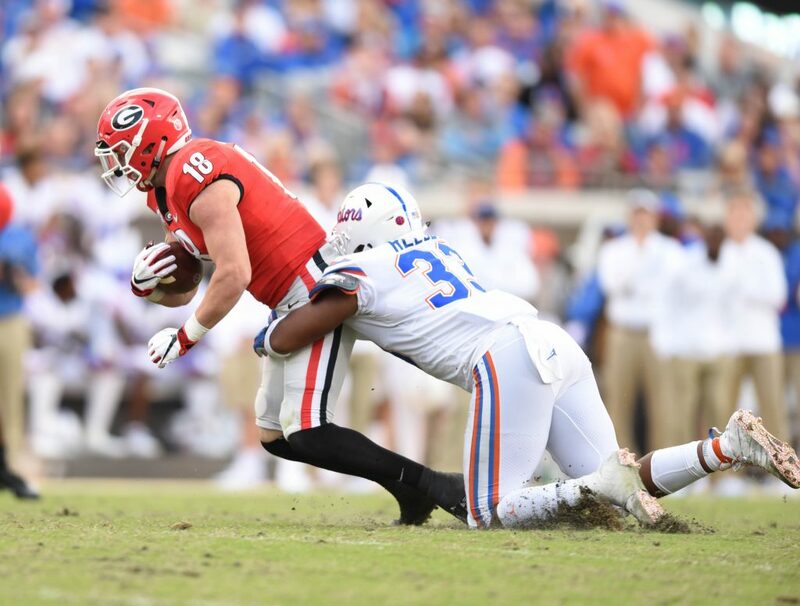 Georgia tight end Isaac Nauta (18) is brought down by Florida lineback David Reese II (33). 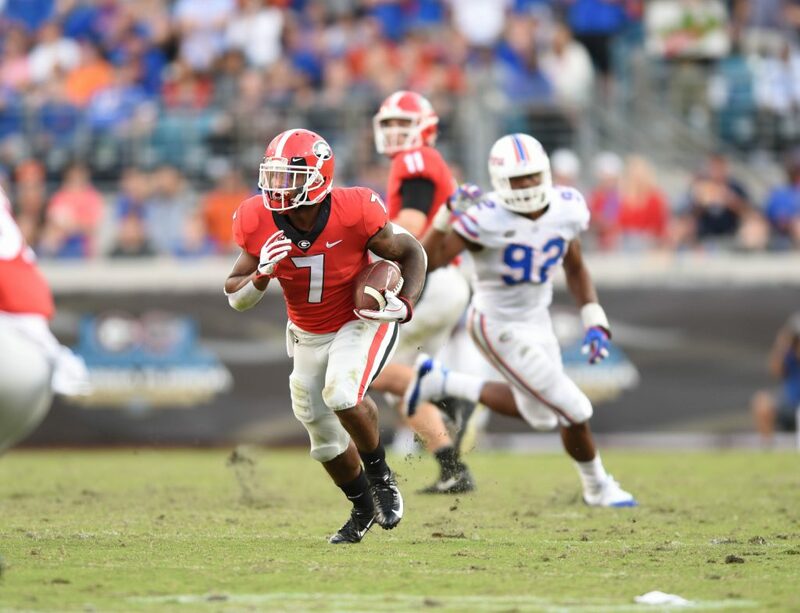 Nauta lead all Bulldogs in receiving, finishing with 73-yards. 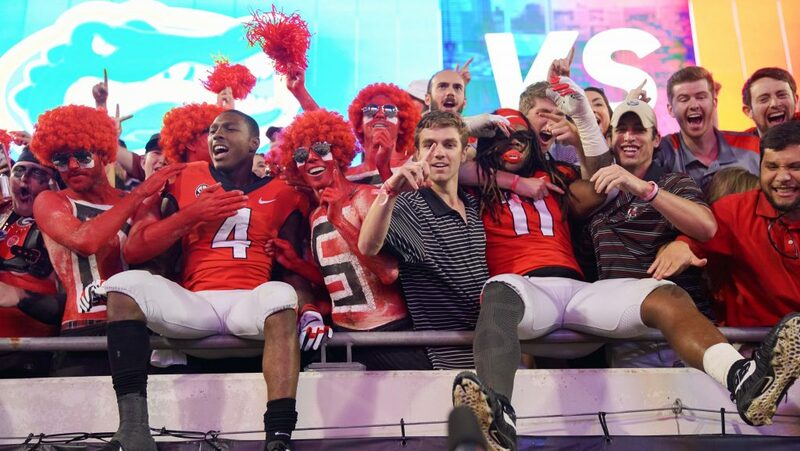 Georgia players Mecole Hardman (4) and Keyon Richardson (11) jump into the student section after the game to celebrate with their fans. 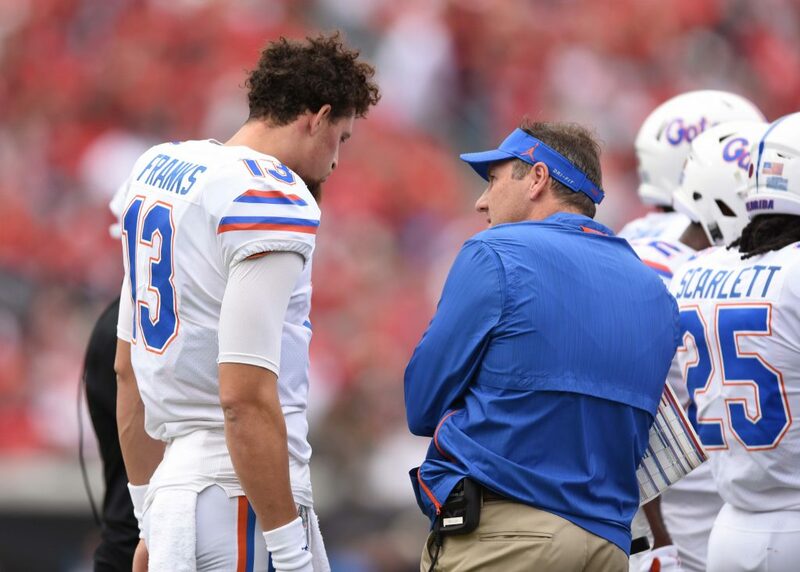 Florida coach Dan Mullen talks with quarterback Feleipe Franks (13) during a timeout. 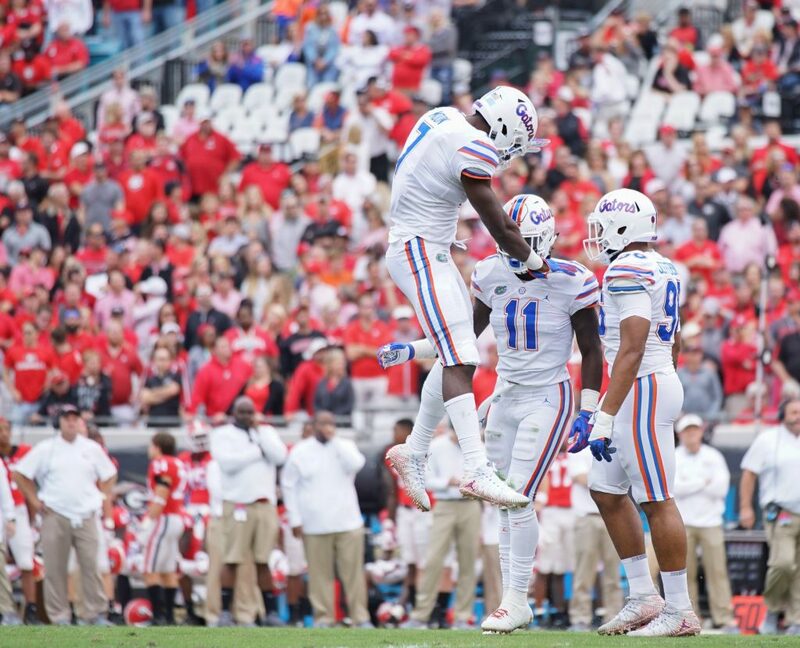 Florida freshman-quarterback Emory Jones (5) saw some playing time against the Bulldogs. 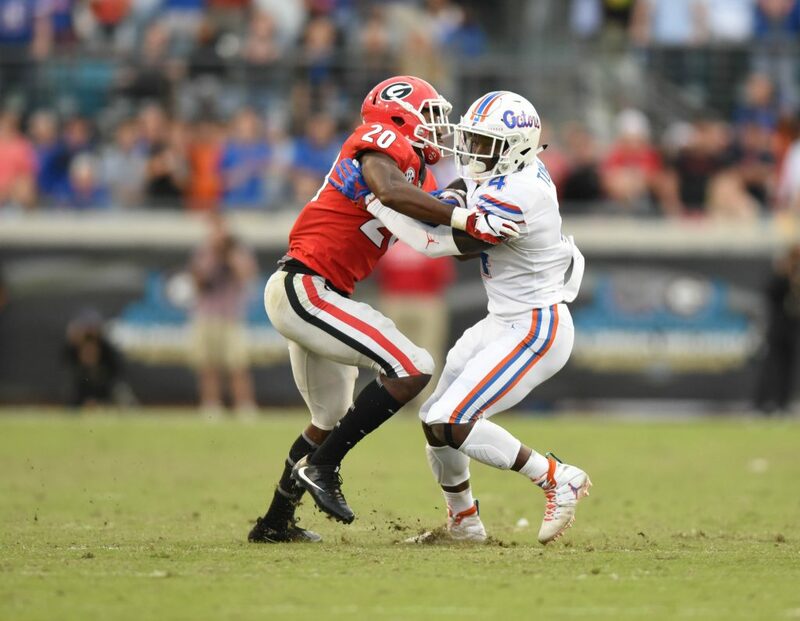 Jones did not complete a pass, but rushed for 12-yards on 4 carries. 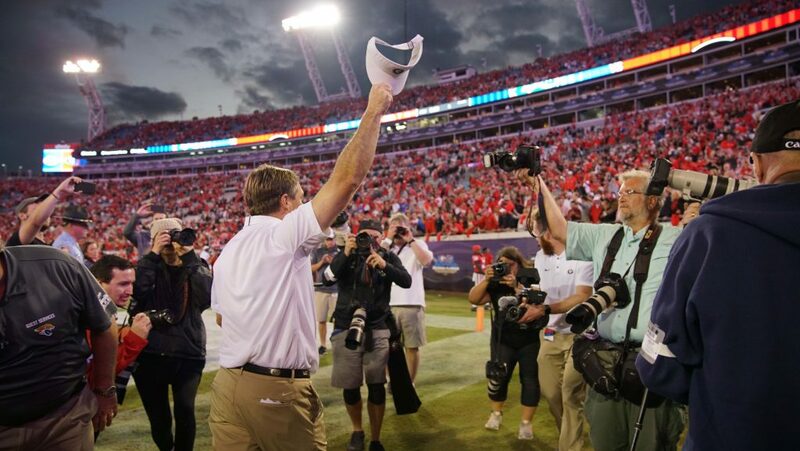 Georgia coach Kirby Smary tips his hat to fans after defeating the No. 9 ranked Gators.